How often does that happen to you that you are in the middle of a conversation and suddenly you find yourself at a loss of an important word which you JUST CAN’T REMEMBER? And then you forget about the conversation and begin the saga of explaining all the attributes of that word hoping that your listener will come up with it eventually. It’s like dumb charades, but without any fun. Let me help you today with some ‘One Word Substitutions‘ that you can use in your daily conversations. • Keep all food items and the potable water well covered. • An anonymous good samaritan gave a huge charity to build the health centre. • Sam is very weird; whenever we go out to a party, he behaves like a glutton. • Being in the entertainment business suits his gregarious persona. • His father’s epitaph read ‘he was a good and honest man’. • She is polyglot because she has lived in many countries. • He has been arrested for his act of blasphemy in the church. • She takes a strong soporific drug to treat her insomnia. • I bagged the first position in the state level extempore speech competition. Well, I hope you learned something new. 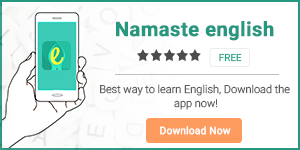 Don’t forget to download our apps-HinKhoj and Namaste English.